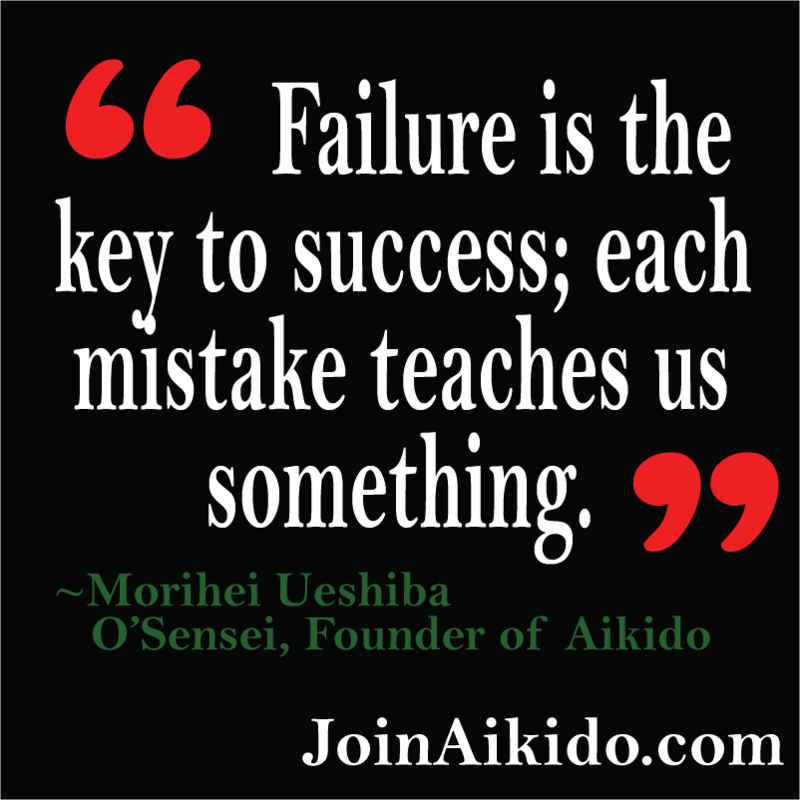 When practicing aikido, or any other martial art, we often focus on over coming our attacker. We want to succeed at the technique we’re practicing. And we want to throw — with power! While this makes sense, in a lot of ways, it’s misguided. Yes, we should practice our techniques carefully to improve our skills. Perfect practice makes perfect, after all. But our learning mostly doesn’t come from getting things right. Getting a technique or movement correct, doesn’t teach us how to improve ourselves. Getting the technique right simply confirms that we understand what’s going on to a certain extent. While that’s certainly valuable, it’s not learning something new. We start learning new things when we fail. Making mistakes gives us the opportunity to change our behavior and adjust our understandings to more accurately conform to reality. We can then adjust our movements and techniques to refine them so that they work better. Do your utmost best. Then embrace your failures. Doing so will speed up your learning and make every aspect of training more fun. In this way, aikido practice is different than school. In school, you are supposed to get everything right. Your grades reflect how correct your answers have been in homework, tests and class participation. If you make a mistake in front of class, that’s an opportunity for humiliation. Mistakes are frowned upon. In school, failure is as bad as it gets. At the dojo, we support and learn from each other. We all make mistakes regularly and help each other overcome those mistakes. We get in front of class and show how we’re having difficulties and we turn those failures into learning. We embrace our mistakes and use them for self-improvement. And fun.